July in Michigan is prime blueberry-picking time! We love visiting a nearby blueberry patch with the family and picking as many as we can. This muffin recipe requires no eggs – and it works perfectly with fresh or frozen berries. The crumb topping adds a delicious crunch you’ll love. In our family, we’re usually looking for recipes that are allergen-free and lower in fat. This simple blueberry muffin recipe combines blueberries with pantry ingredients I always have on hand. Bake ahead and freeze for an easy breakfast treat! Heat oven to 400ºF. 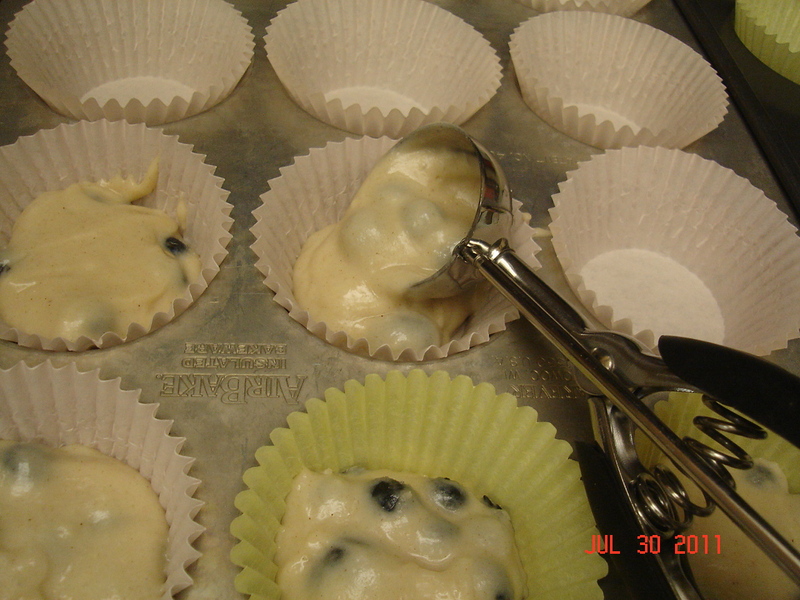 Prepare muffin pan with non-stick spray or cupcake liners. Mix dry ingredients in a large bowl (flour, sugar, salt, cinnamon and baking powder). Add milk and oil. Stir until blended. Carefully fold in washed blueberries (you can use frozen berries; don’t thaw them first). Divide batter into 10-12 muffin tins. Optional crumb topping: if desired, combine ¼ cup sugar, 2 tablespoons + 2 teaspoons flour, 1 tablespoon cold butter and 1 teaspoon cinnamon. 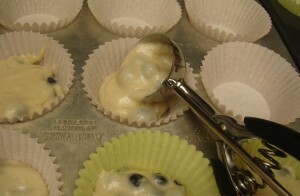 Mix together with a fork until crumbly and sprinkle over muffin batter before baking. Bake 22-28 minutes. Makes 10-12 blueberry muffins. Use a medium cookie scoop for mess-free batter distribution! to save this recipe to your Pinterest account for future use! Did you just pick berries or find a great sale price? Freeze fresh blueberries, unwashed, on a cookie sheet. Measure in 1-2 cup portions and place in freezer bags to use in future recipes. Looking for a great full fat recipe instead? 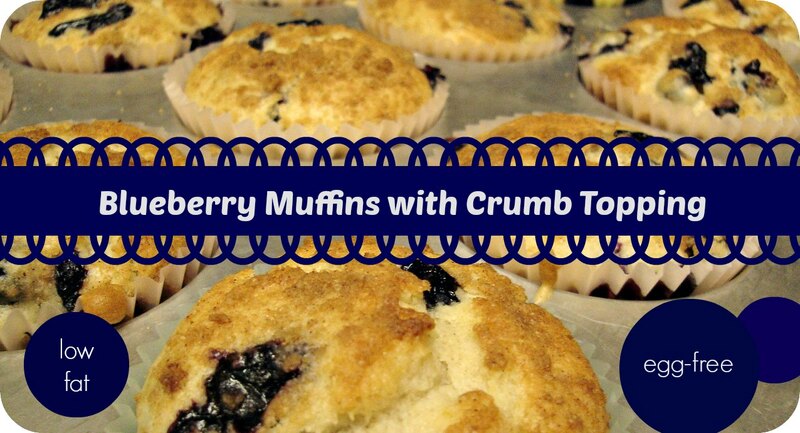 Try these To Die for Blueberry Muffins. I have always adored the breadsticks at Olive Garden – and with the help of my trusty bread machine, I’ve learned to make them quickly with just a few ingredients. There’s not a person in the family that doesn’t gobble them up – we especially love them with Chicken Marsala, Lemon Pasta with Chicken or spaghetti (and we look for any possible excuse to make them). If there are leftovers, I cut them in half lengthwise and the kids eat “breadstick sandwiches” for lunch the next day (just like mini sub sandwiches). 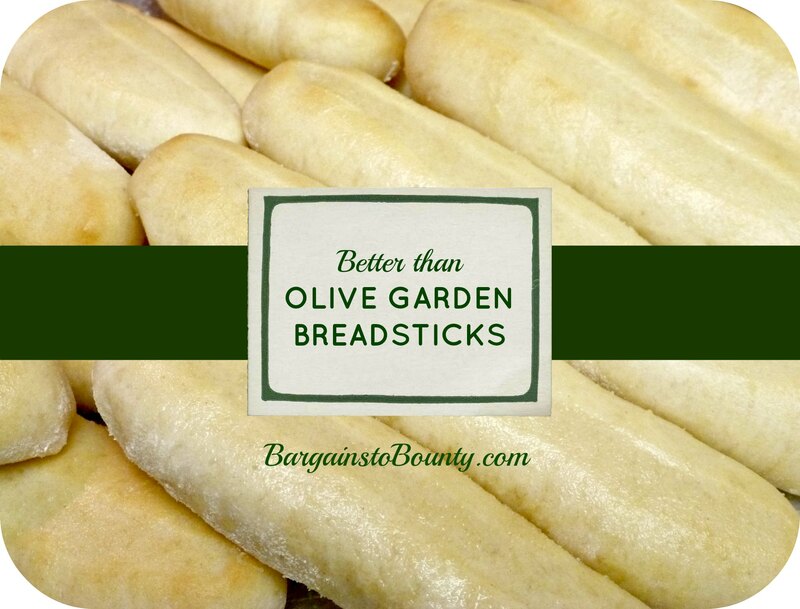 My husband always insisted they were “better than Olive Garden breadsticks” and I thought he was being nice. But in the last year or two, I think he might be right – there’s just something about these when they’re homemade, soft and fresh from the oven that beats the restaurant variety.  Try it for yourself and see! Add ingredients to your bread machine in the order listed above. Set machine to the DOUGH setting and run. After dough cycle is complete, place dough on a floured work surface and shape into a long rectangle. (Don’t press it too thin – about 3/4″ thick). 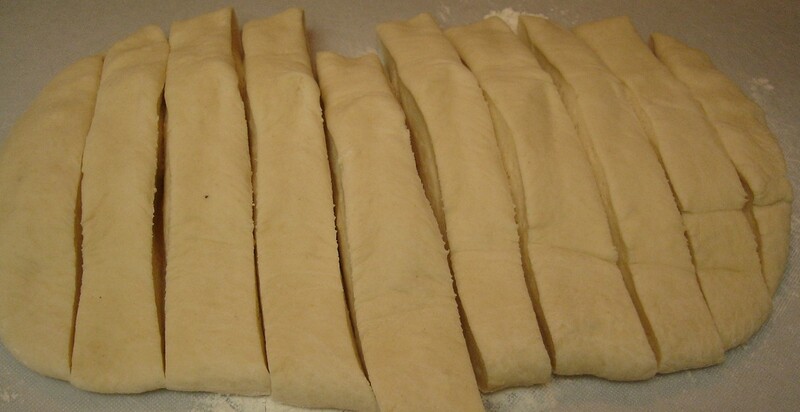 Using a sharp knife, cut the dough into 10-14 short vertical strips. Resting each strip on its a cut side, flatten it gently into the flour. Place dough sticks onto a cookie sheet and cover with a towel. I like to let them rise covered in a 175 degree oven for 10-15 minutes. Remove the towel, turn the oven to 400 degrees and bake for 8-10 minutes until breadsticks are lightly golden. Melt 1 Tbsp butter/margarine with 1/2 tsp garlic powder and 1/2 tsp salt and brush over hot breadsticks. (Sprinkle with grated Parmesan if you like). Serve while warm! I found it very time-consuming to roll breadsticks with the consistency of this dough – it’s much easier to cut the dough and flatten each strip! To make the recipe dairy-free, substitute soy margarine in place of butter. You can also choose to sub whole wheat flour. If you’re in a hurry, use the quick dough setting on your machine (if you have one) or remove the dough before the cycle ends. Your breadsticks might not be as soft, but you won’t be able to tell the difference. 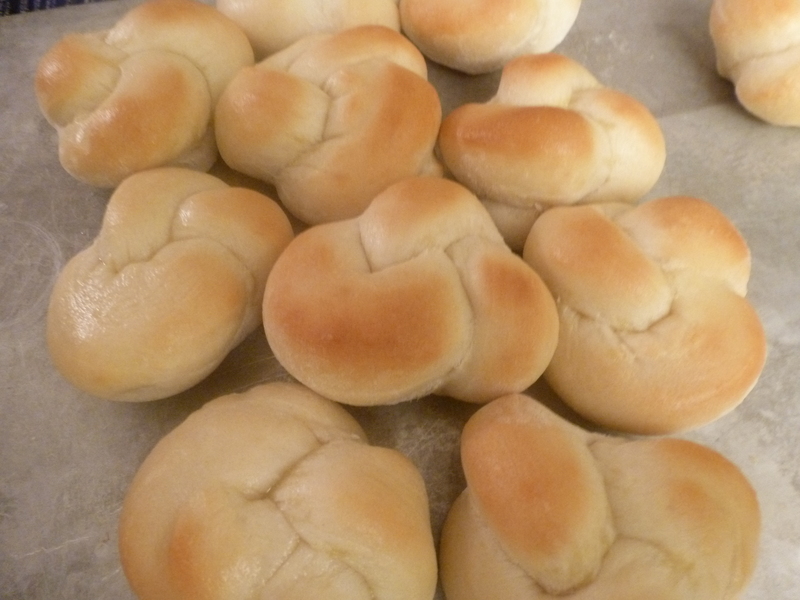 For special occasions, I tie each strip of dough into a knot gently and tuck the ends underneath before baking to make garlic knots. If you don’t have a bread machine, don’t worry! Try this version from Finding Joy in My Kitchen that uses a stand mixer. Love your bread machine? Don’t miss this Easy Homemade Sandwich Bread recipe – it’s our favorite! 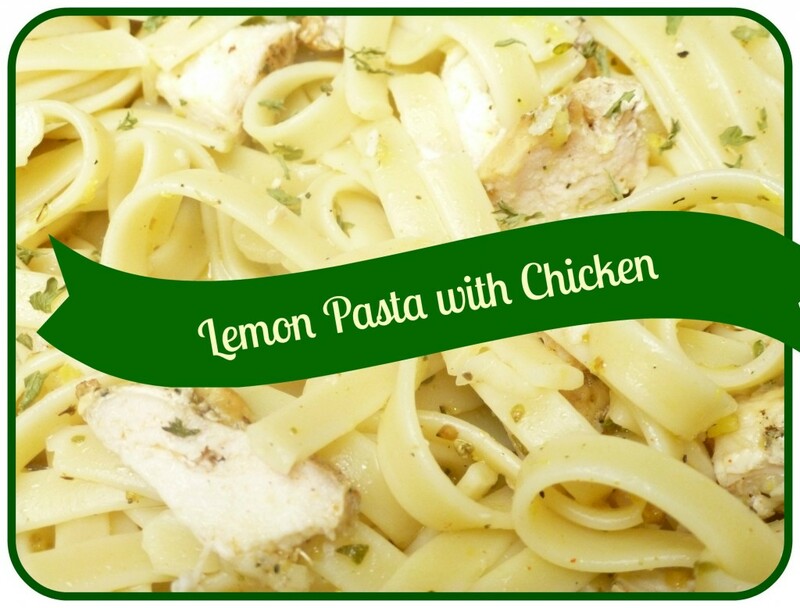 There’s something light and fun about lemon pasta, yet still remarkably comforting. The white wine in this dish gives it a depth that mimics restaurant quality. Serve with Better than Olive Garden Breadsticks and salad for an amazing meal that won’t weigh you down! Best of all, you’re likely to have most of these ingredients waiting in your pantry! Begin by boiling one box of pasta (long noodles or bowties work well). In a large measuring cup, combine liquid ingredients, herbs and seasonings and mix well. Drain pasta and add cooked chicken and lemon “sauce.” Stir to combine. If time allows, pour pasta, sauce and chicken into a 9×13″ pan and cover with foil. Bake in a 350 degree oven for 15 minutes until warmed through. (If you’re in a hurry, leave the pasta mixture in your pan and heat on medium-low for a few minutes while stirring to heat). I like to use a can of chicken broth (2 cups) and prepare 2 batches of sauce in separate measuring cups. I use one to prepare the meal and freeze the extra sauce in a quart freezer bag to save on prep time later. On a busy night, I can cook pasta, warm frozen diced chicken and thaw the extra sauce – it’s an easy recipe to throw together! Aldi’s Winking Owl brand white wine is an affordable option (around $3/bottle) that works well in this dish! This Sticky Lemon Quick Bread is tart, sweet, and very lemony – and one of my very favorite quick bread recipes! 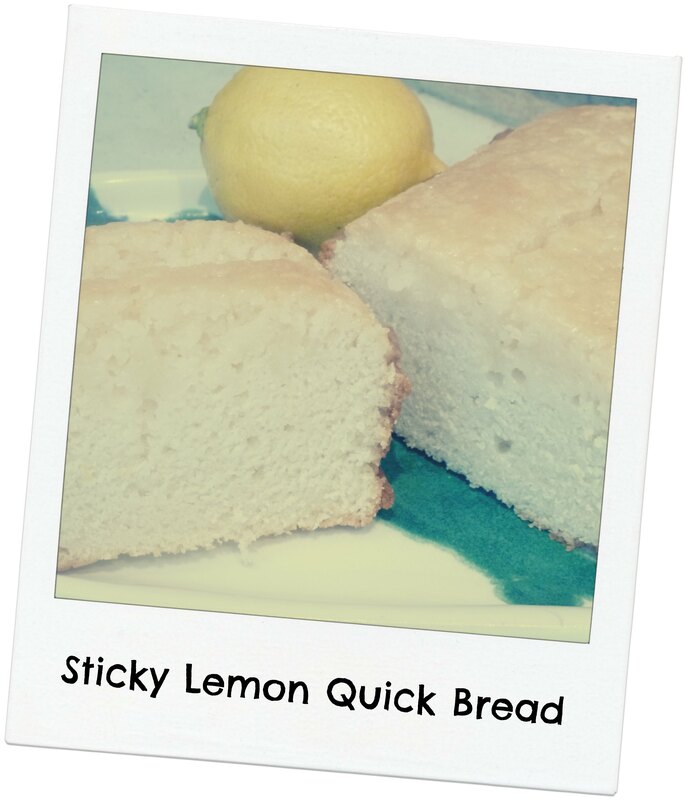 In spite of the rich taste, it’s lower in fat and can easily be made dairy-free.This lemon quick bread freezes very well (and tastes even better chilled! ), so I always double the recipe. The glaze makes the recipe, so don’t forget that last step! Preheat oven to 350° F. In a medium bowl add vinegar to milk and stir well to “sour” the milk; set aside. Mix dry ingredients in a large bowl and whisk well to combine. Add oil, eggs, and lemon zest to the sour milk. Whisk well until thoroughly combined. Add wet ingredients to dry with a few swift strokes of a spoon just until blended. Pour batter into a 9×5″ loaf pan sprayed with nonstick cooking spray. Bake for about 1 hour or until done (test by inserting a toothpick in the center of the loaf – bread it done if it comes out clean). While bread bakes, juice the lemons and stir glaze ingredients together until sugar dissolves. After baking, while bread is still hot, loosen the loaves from the edge of the pan, and prick bread carefully all over with a skewer or toothpick (this part is fun for kids to do!). Pour lemon glaze over bread, and cool in pan on rack. 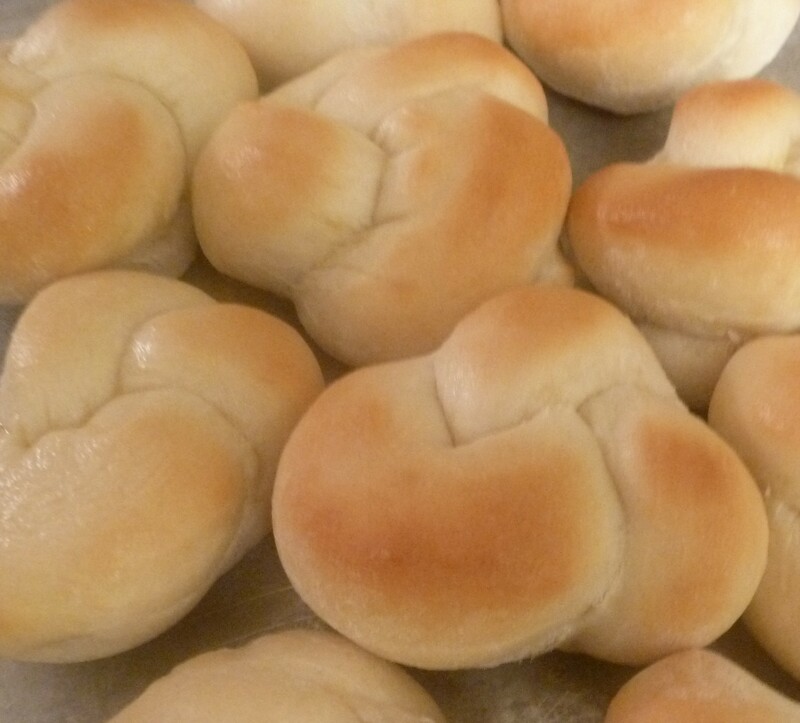 I make my bread with soymilk and substitute 4 egg whites in place of eggs – the taste and texture is still perfect. If you have buttermilk to use, replace the milk and vinegar with equal amounts of buttermilk. I wash the outside of the lemons very well, then use a microplane grater to zest them. If you don’t have one, a fine cheese grater (used gently) should do the trick. Remember to avoid the bitter white pith and only zest the yellow skin lightly. To freeze, wrap loaf well in plastic wrap (or wrap slices individually for small treats), then seal inside a freezer bag. Use within 3 months. I think this lemon bread tastes best slightly frozen or chilled! Do you ever wonder WHY you’d want to buy 10 pounds of chicken at a time? Yes, buying in bulk often has benefits – and a lower price is only one of them! Preparing meals in bulk ALSO has benefits (and I can’t recommend it highly enough, especially if the dinner hour in your house is as crazy as it is in mine)! You’ll sometimes find chicken leg quarters or drumsticks on sale for less than $0.50 per pound – and that’s a great time to stock up and freeze. Simple Recipes for Bone-In Chicken Pieces: Leg Quarters, Drumsticks, Thighs, etc. Soak a whole bird or pieces in this mixture of sugar, salt and water – and you’ll be amazed! A marinade of soy, lemon, vinegar & garlic – to freeze with the chicken & enjoy later! Amazing what condensed tomato soup, cranberry sauce & onion soup mix can do! Use skinned bone-in chicken in soups for great flavor and health benefits! Use cooked, shredded chicken to create a taco filling perfect for nachos, tacos or salad topping! Use this ice cube trick to create single-serving portions! Skinned chicken pieces coated in a sauce of chicken broth, paprika & sour cream. Prep and freeze, then slow cook later. Great served over noodles! Mild lemon zing that keeps the chicken tender. Brown chicken, then transfer to a slow cooker and let it cook for 8-10 hours for an elegant meal. Brown chicken in a skillet, then let the crockpot do the rest – with garlic, lemon and oregano. 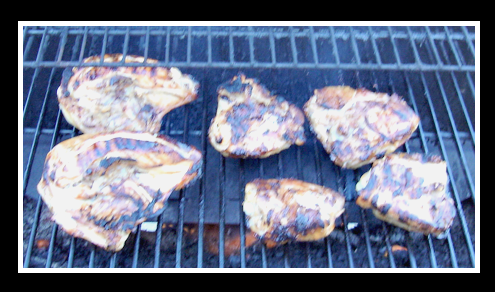 A marinade of soy, canola, garlic, ginger, and more! Arrange chicken, potatoes, & carrots in a sprayed 9×13″ baking dish. Pour dressing over the top. Sprinkle with cheese and pepper. Bake at 400 degrees for 40-50 minutes or until chicken is cooked through. Do you have a bone-in chicken favorite? Be sure to comment and share your recipe!